While cruising the Danube with AmaWaterways this week, I had the pleasure of seeing AmaMagna as she was being made ready for her maiden voyage on May 5. I wasn’t allowed to take photos of the interior, as she is awaiting her furnishings, and AmaWaterways doesn’t want to spoil the surprise. Still, the attention to detail did not escape me. I was able to view some of the staterooms aboard. My favorite? The Junior Suite. The bed in this suite faces the river, allowing guests to take in the unobstructed views of the river as they sail. Staterooms and suites also feature touch panel lighting controls, a nice touch (no pun intended). Another highlight aboard was Jimmy’s Wine Bar, which is a cross between a cozy pub and a wine cellar. Dark wood and mood lighting almost make you feel as if you are underground – just as you would in a wine cellar. I also got to see the water sports platform at the back of the ship and the nearly all glass fitness room, situated aft, and with sweeping views of the river. Although my tour was brief, I feel that the new features on AmaMagna make it a great choice for first-time river cruisers (particularly those converting from small ship ocean cruises) or families. 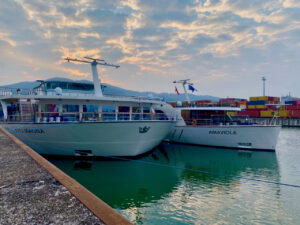 Watch for more about AmaMagna during the coming weeks on River Cruise Advisor.